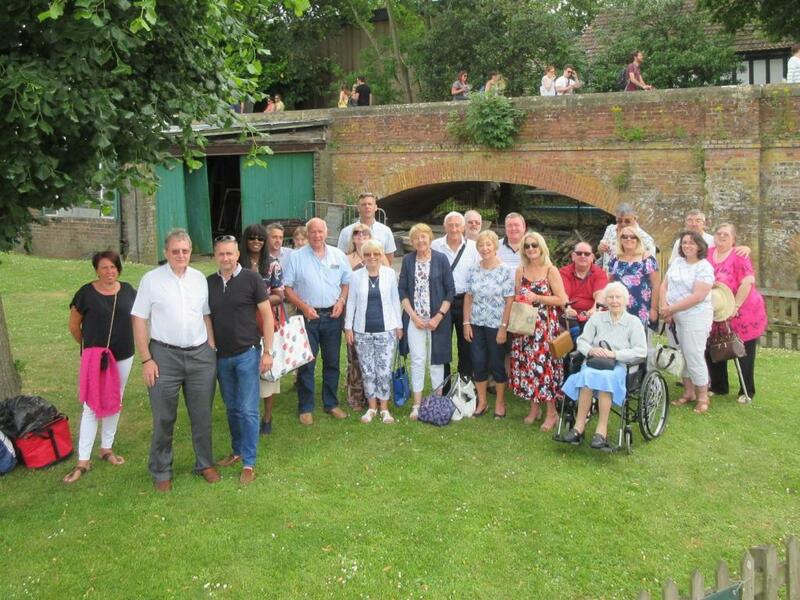 On Saturday 23rd June 22 members and guests enjoyed an extended cruise on the river at Stratford on Avon in glorious sunshine. Strawberries and cream were served on the boat with glasses of Prosecco to wash them down. 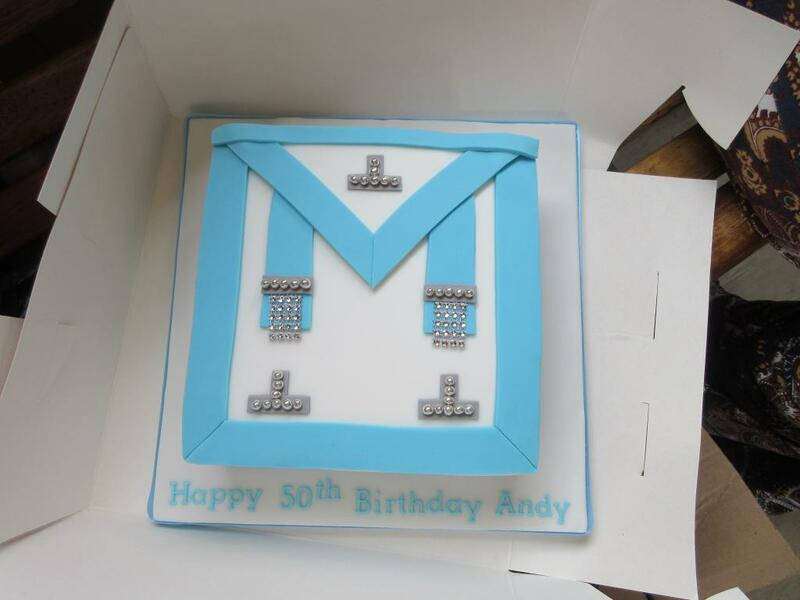 That day was the Worshipful Master’s 50th birthday and his lady Cheryl presented him with a specially made cake in the shape of a Master Mason’s apron. More Prosecco was quaffed in toasting the Master’s special birthday. Conquering the Three Peaks challenge in 21hr 19mins and raising £2025 for Birmingham Children’s Hospital just wasn’t enough for Loyal Traveller, Brother Matthew Vale. Just 4 weeks later the intrepid explorer embarked on a second charity walk, this time a race to the centre of Hadrian’s Wall. Racing over the course of two days, two teams set off from either side of the wall in a race to the Sycamore Gap Tree marker. In total Matthews team covered 67km averaging 4.5 k/m hr from the West, ascending 1084 metres and descending 849 metres to win the challenge in exactly 15 hours. Brother Vale raised £1000 to add to his previous challenge and in total raised £3025 for charitable causes during the summer. The Loyal Travellers completed the masonic Spring season in style as our final two ceremonies were the passing of Bro’s Thompson and Vale to the degree of Fellowcraft freemasons. As with any of the Loyal Travellers meetings carried out this season; fantastic word perfect ritual took centre stage as both meetings were completed skilfully by those Brothers taking part. A superb year thus far has seen Bro. Dr Andrew Hardie take the chair as Worshipful Master, the final meeting ending with the candidate reciting his 1st degree obligation, an exemplary presentation of the extended 2nd degree working tools and a mesmerizing display of the extended 2nd degree tracing board. Quite a treat for a season-ending finale! But as one season ends it is time to look forward. If you’re new to the idea of Freemasonry and have found your way to reading this news item you have taken the first step towards joining our wonderful fraternity. Of course, the first two paragraphs will be somewhat unintelligible but fear not…..we didn’t have a clue either! Freemasonry is an amazing journey of becoming a better man through brotherly love, relief and truth. The popular Sky1 programme Inside the Freemasons will have offered a fantastic insight as to how we achieve this. When finding a lodge, there is a lot to consider. But look no further the Loyal Travellers has much to offer the future candidate. · Our lodge has as a fantastic mix of brothers of varied experience and age groups from different stages of their Masonic journey. From Entered Apprentices through to the Provincial Grand Master, we have a wealth of experience. · We meet on a Saturday. Generally our meetings are from 4.45pm to around 9.30pm once a month for 5 months of the year. This offers the opportunity to better fit Masonry around our normal working lives. · The Loyal Travellers have an excellent mentoring system that supports a Brother from the day he enquires and throughout his journey. 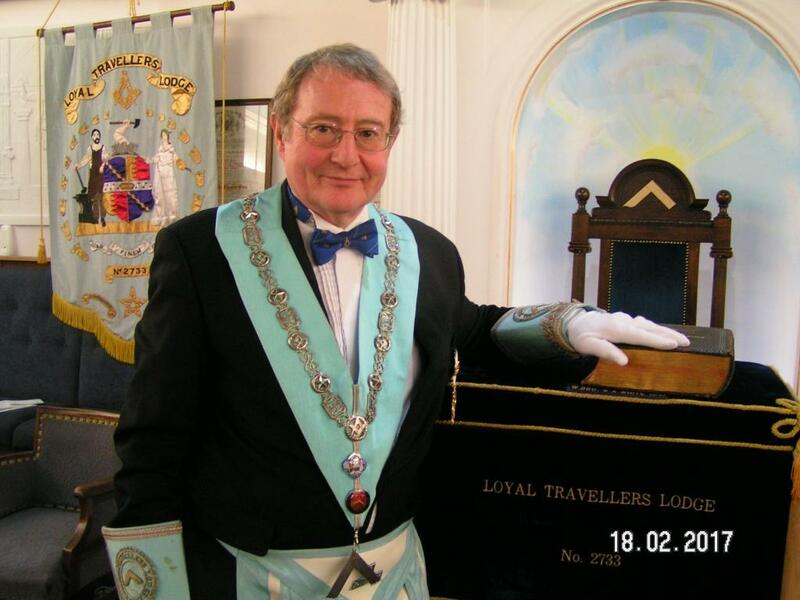 · We have the use of the fantastic Knowle Masonic centre as a back drop to all our undertakings. 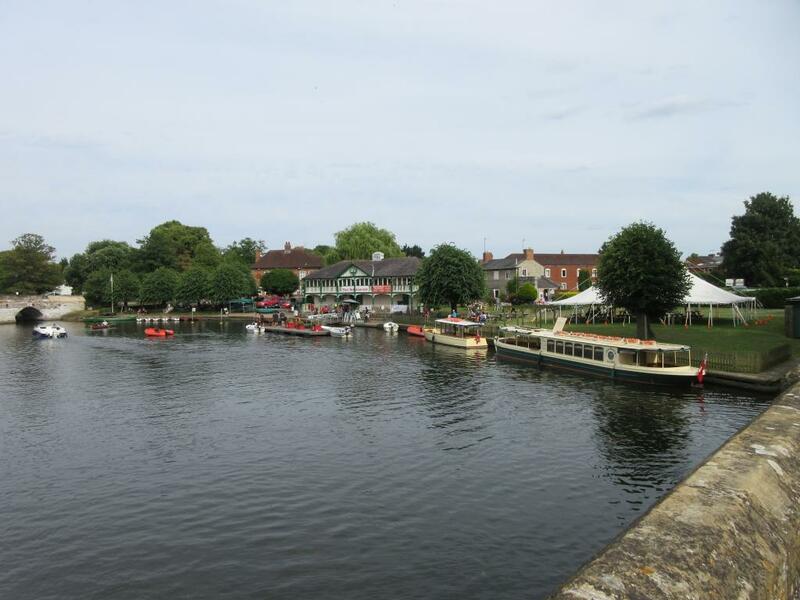 The centre is within a few miles of Solihull and the M42. Brethren, readers and future candidates…..have a fantastic summer! We look forward to reacquainting many times over the break before our business recommences in October. Congratulation must go to Matthew, one of our newer members, on completing the 2017 Three Peaks Challenge in 21 hours 19 minutes, well ahead of the 24 hour deadline. Matthew raised £1500 for the Birmingham Childrens Hospital charity fund. A magnificent effort, well done Brother. The whole event raised a very creditable £60,000 for a variety of charities so Matthew's contribution was quite significant. Not content with that achievement Matthew has signed up for the Hadrian's Wall Challenge and no doubt with the generous sponsorship of his lodge Brethren will raise at least as much again if not even more. 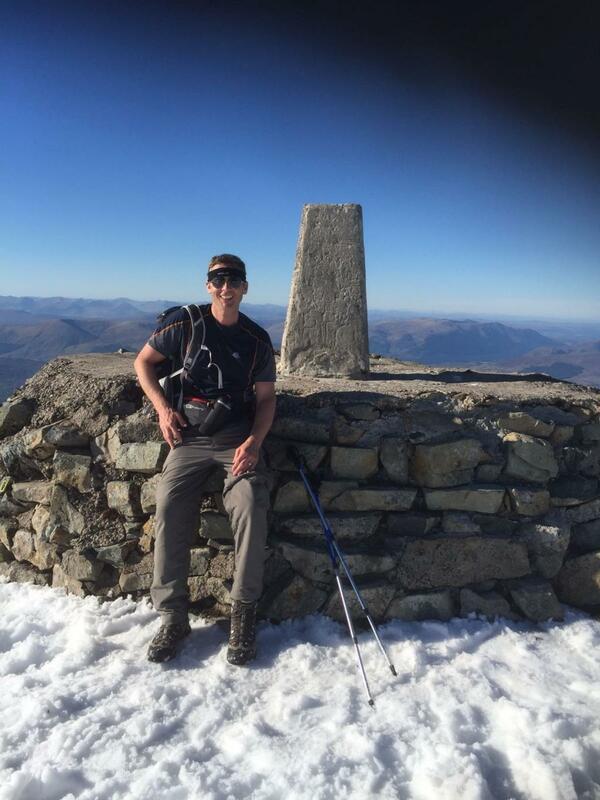 Picture: Matthew taking a short breather on the top of Ben Nevis. We knew we were going to be in safe hands when our Master Elect Bro. Dr. Andrew Hardie arrived at the Knowle Masonic centre in the company of his twelve visitors; looking fresh and prepared for the Installation ceremony ahead. Fifty-four brethren pack through the doors of the Lodge to take their seats and the room begins to represent a Masonic Tardis. The lodge duly opened it was soon time to welcome our newest Joining member, Bro. Anthony with unanimous approval. The Installation quickly began in earnest and by degree the Brethren slowly streamed out as Bro. Hardie’s installation ceremony progressed. On their return the Master would be “elect” no more and would be sat in King Solomon’s chair. As if he had come Back from The Future, the Doc then presided over the Lodge with the confidence one would normally associate with a seasoned Master. The Closing in full of each degree was a particular treat and the whole evening was expertly overseen by the Presiding officer, the Acting Prvincial Junior Warden. Our work being done the Brethren retired to the festive board where the evening was spent in good humour, song, excellent food and good wine. 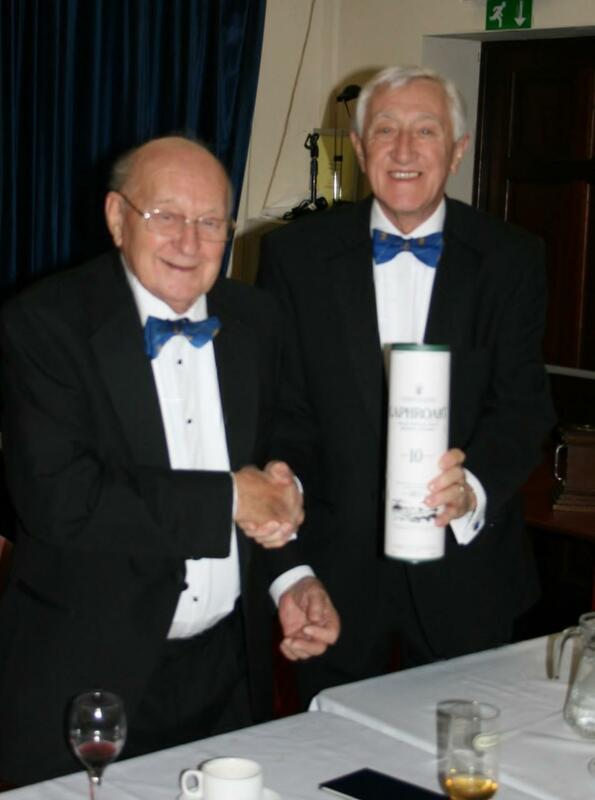 The Provincial bottle of malt whisky was raffled and raised £334 the prize being won by the Installing Master W.Bro. Mike Perrott. The Charity appeal was equally well supported and raised £265 for the Warwickshire Masonic Benevolent Fund. Thank you Brethren. Our diagnosis….. a job well done. Let’s see you at our next merry meeting for the Passing of Bro. Thompson. The scene is set, bow ties are on and the Loyal Travellers have just completed a sumptuous 4 course dining bonanza with our 20 visitors. Forty-five brethren sit in anticipation of the forthcoming speech as Brother Andrew Irving, JW takes to the dining room floor to give what has become a highlight of the evening… the visitors’ speech. The visitors were greeted by the Brethren in great Loyal Travellers’ tradition warmly, genuinely and sincerely as, led by the words of our Junior Warden, everyone reflected on the evening’s work. Casting our minds back just two hours previously, we realise that Past Masters night is something special at Loyal Travellers lodge when once a year the Past Masters provide a tantalising treat of Masonic ritual, wittiness and word perfect demonstration. Tonight the ‘A Team’ of Past Masters must be operating at their very best for the forthcoming ceremony of Raising. As the first of three Masters took the chair good humour was established from the outset. A ripple of expectation ensued as the Provincial Grand Master took the role of Junior Deacon watched carefully (and noted for future reference!) by the Visiting Officer W.Bro Barrie Ratcliffe. As the degrees passed two further WM’s took the Chair with their unique style, both demonstrating enviable standards as they raised Bro. Paul Bannister to the Third Degree. Ritual complete, salutes and ceremony over; the Brethren retired to the dining room where the festivities continued. The Visiting Officer, W.Bro. 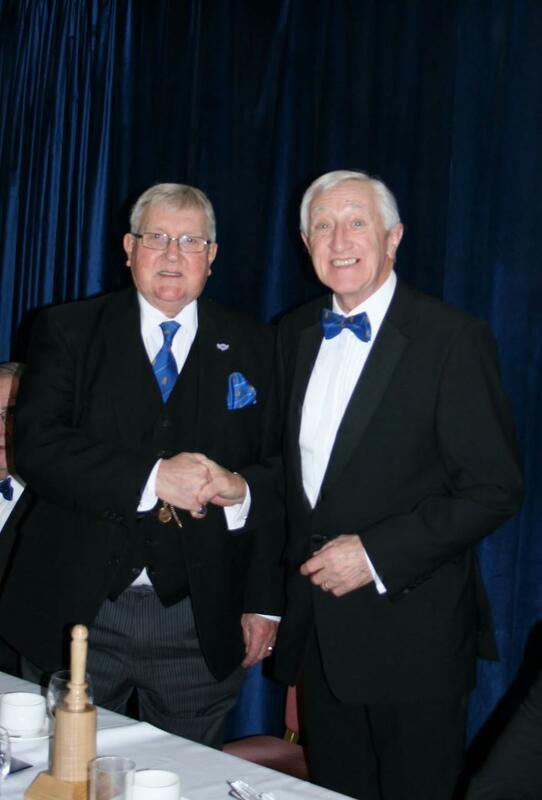 Barry Ratcliffe (left in picture) was welcomed by the Worshipful Master for the evening, W.Bro. Michael Perrott who later presented W.Bro. Alan Smith with his raffle prize of a bottle of Laphroaig whisky (sip it slowly Alan!). “Brethren, you enter our lodge as our visitors, but you leave as our friends”.